One of the first wildflowers to appear in Britain each year, the Snowdrop signals the end of the worst of winter's weather and heralds the approach of spring. Snowdrops have narrow strap-like leaves almost as tall as the flower stalks. They grow to between 8 and 16cm tall, each bulb producing a pair of grey-green leaves and a smooth, leafless scape bearing a bract and a single flower bud sheathed, initially, by a papery membrane. The campanulate (bell-shaped) flowers are pendulous, opening to reveal three large white outer sepals and three smaller notched green-veined inner petals. Enclosed by the inner petals are six pollen-bearing anthers. Occasionally we come across flowers with four petals and sepals. Like other members of the Amaryllidaceae, Snowdrops are also able to multiply via bulbils and to reach new territory when rain washes the shallow-rooting bulbs from disturbed soil and transports them during floods - see the note below. 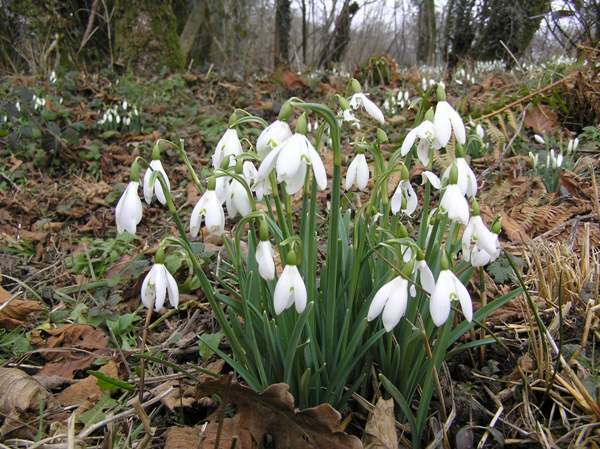 Widespread throughout the UK except in the very far north of Scotland, Snowdrops are mainly naturalised in the countryside having escaped from gardens. It is just possible that Snowdrops, which are known to be native to parts of southern Europe - from the Iberian Peninsula eastwards to the Ukraine are - are truly native to some parts of southern England. 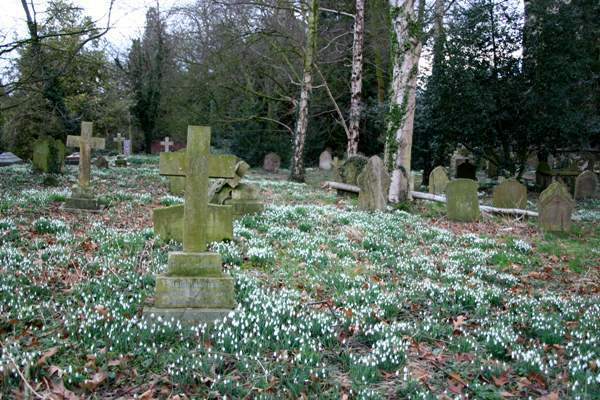 It had been thought that the Romans introduced Snowdrops to Britain, but experts now believe they arrived in the early sixteenth century. Certainly by the time John Gerald was writing his Great Herbal (first published in 1597) this spring flower had made its way to England and was described by Gerard, and in the second edition of 1633 he referred to it by the common name Snowdrop. The reason why Snowdrops are so common along watercourses is that bulbils become detached from the plants in high water and get swept downstream and settle on other sections of riverbank. 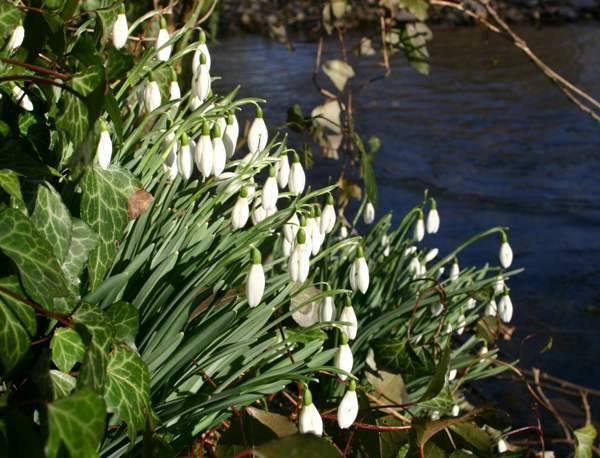 In very mild British and Irish winters, the first flowers open in January, but February and March are the main times when you will see riverbanks and roadsides carpeted with Snowdrops. 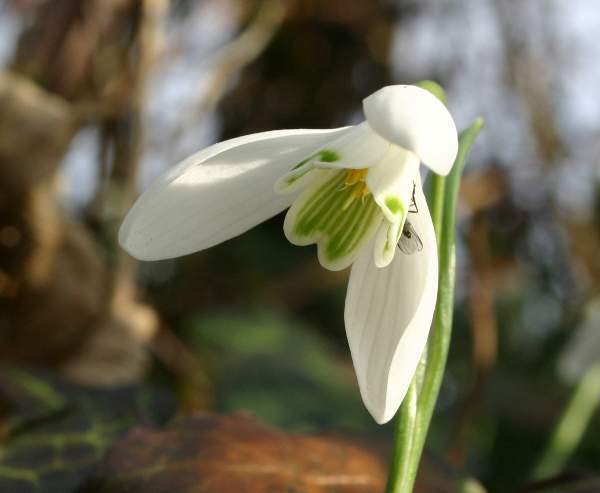 Because they tend to be mainly small, most of the flies and other insects of early spring tend to go unnoticed; however, they seem to have no difficulty finding Snowdrops, which benefit from their assistance with pollination. 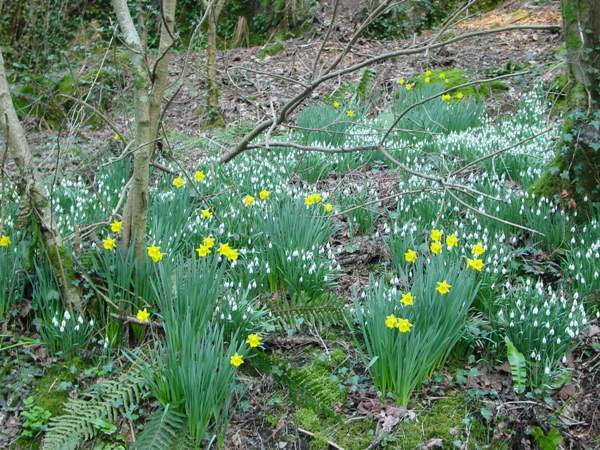 Above: Snowdrops and Daffodils in a West Wales woodland setting. This wildflower was described scientifically by the great Swedish botanist Carl Linnaeus who, in 1753, gave the Snowdrop its currently-accepted scientific (binomial) name Gallanthus nivalis. Inevitably, because of their beauty and the fact that they bloom so early in the year when few flowers are evident, Snowdrops have been subject to extensive cultivation. Gardeners can now choose from a range of sizes and blossom forms, including double varieties; and some cultivars bloom in January while others have been selectively bred to provide displays well into March and even April. Snowdrop bulbs are poisonous, and so it is important to keep them away from places where young children might pick them up and eat them. The genus name Gallanthus was established by Carl Linnaeus; it comes from the Greek words gala, meaning milk, and -anthos, meaning a flower - a milky white flower, therefore. Much more obvious is the Latin origin of the specific name nivalis, which means 'of the snow' - a reference to the season in which these flowers bloom. 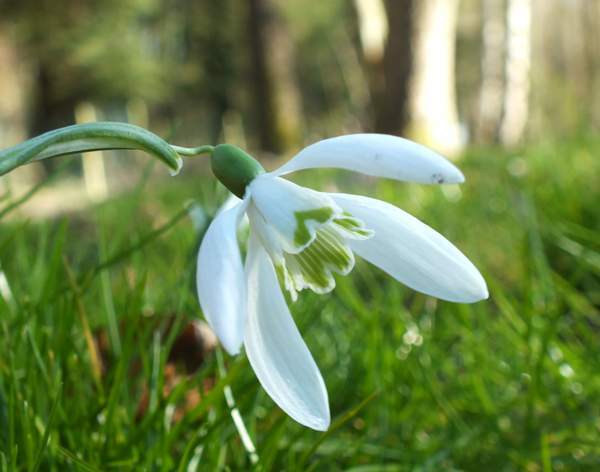 The origin of the common name Snowdrop is hotly (or should that be frostily!) contested, but before they open fully the flowers are shaped very much like raindrops but their colour is snowy white. There have been several other suggestions for the origin of the common name, but that one is quite good enough for us! Spring Snowflake Leocojum vernum has six equal tepals (petals and sepals) in a bell-like flower. Autumn Snowflake Acis autumnalis (synonym Leocojum autumnale) is similar to the Spring Snowflake but it has pink-tinged flowers in the autumn.